Most of my tomatoes did ripen in the end and I have harvested the last of them and put the green ones in brown paper bags with bananas to ripen them). They haven't tasted as good as last year and I'm not sure why. We haven't had a lot of rain, but they taste a little watery. perhaps because I have had to use a hose and they have had too much at any one time. So to intensify the flavour I have roasted them in the oven with my home-grown garlic and thyme and a bit of olive oil and salt. I then put the roasted tomato mixture in sterilised jars. I'll be testing some of it tonight with pasta. The topsoil in our garden isn't very good (that which remains after we lost a lot of it in the landslip in 2017). It is heavy clay on top of loess, which is a glacial wind-blown silt that forms dense pans that plants find hard to get their roots into. So it's needs a lot of improving. 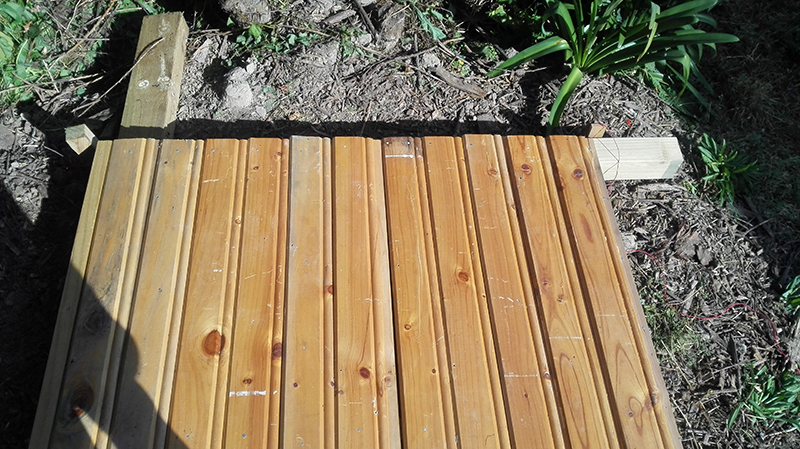 As well as compost and bokashi, I am using thick layers of wood chip mulch, which will break down eventually to feed the soil (I was inspired by the woodchip-covered garden, if not the proselytising, in this YouTube video). In the meantime it works to regulate the moisture content of the soil and to keep weeds at bay. As I write this, I have packed about 65 bags and moved about two dozen horse buckets of mulch up to the back section. And I haven't finished. I’ve done it. 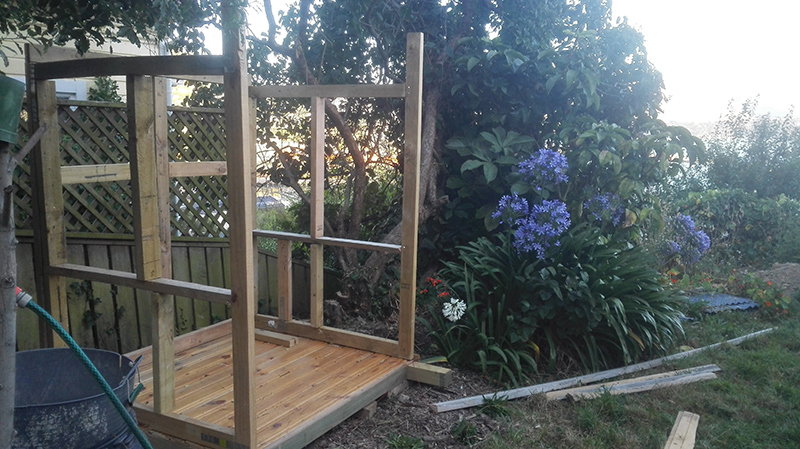 I’ve (nearly) finished my potting shed. Almost everything has come from the renovations we've done on the house. 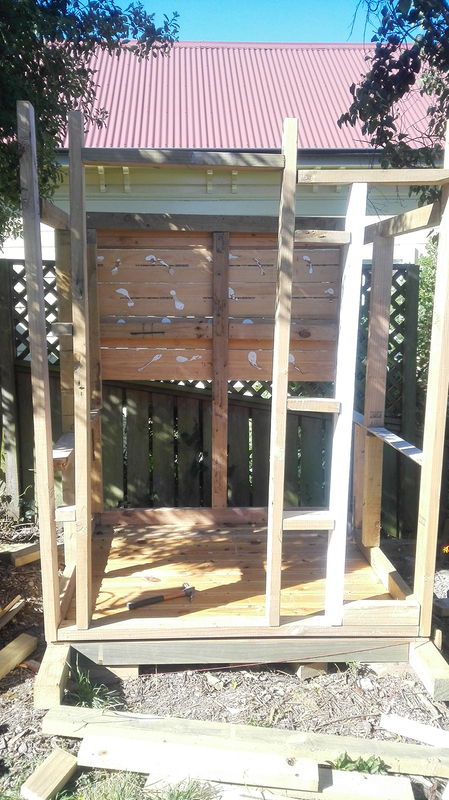 The wood framing/deck/plywood was leftover from rebuilding the back room, replacing the floor in the bedroom and replacing the veranda. The windows are the ones we replaced when we put in double glazing. 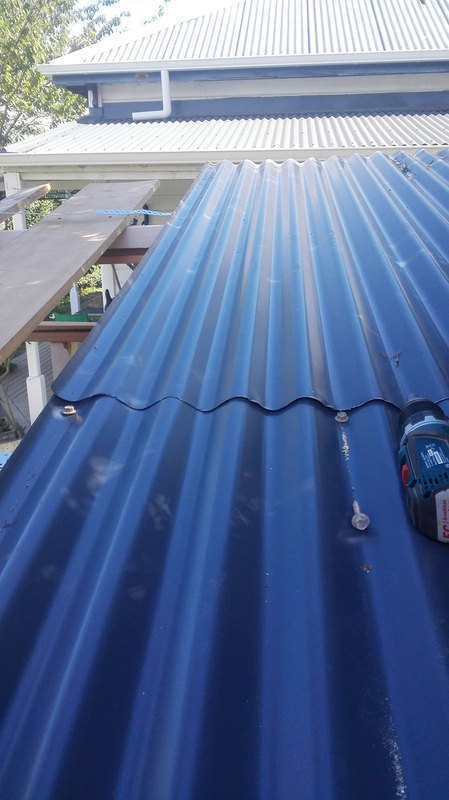 The corrugated iron cladding and roof are from when we replaced the veranda roof. 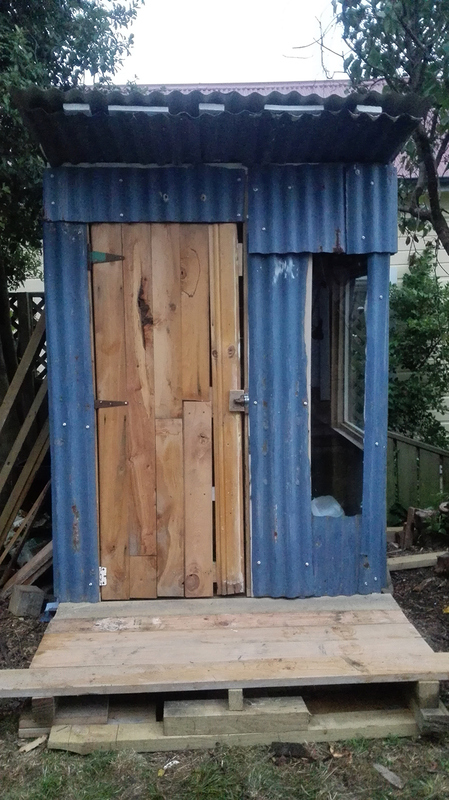 I bought old hinges from the eco-shop on Blenheim Road. The only new materials were nails and screws. 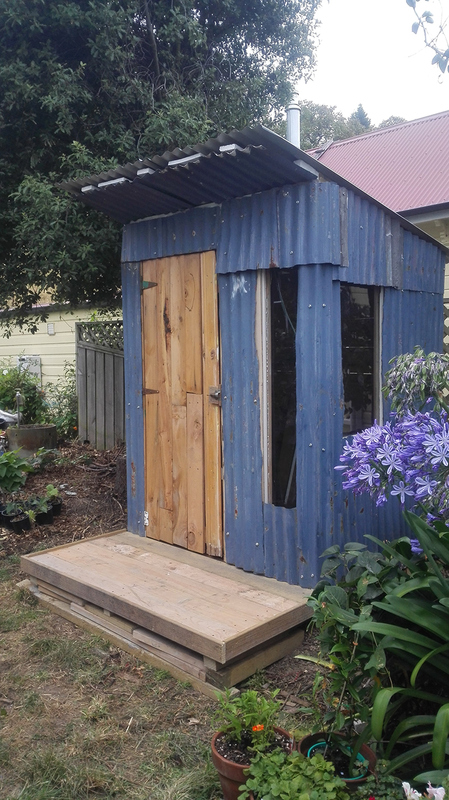 All up, the shed cost me about $100 in money, but a lot of hours in time. 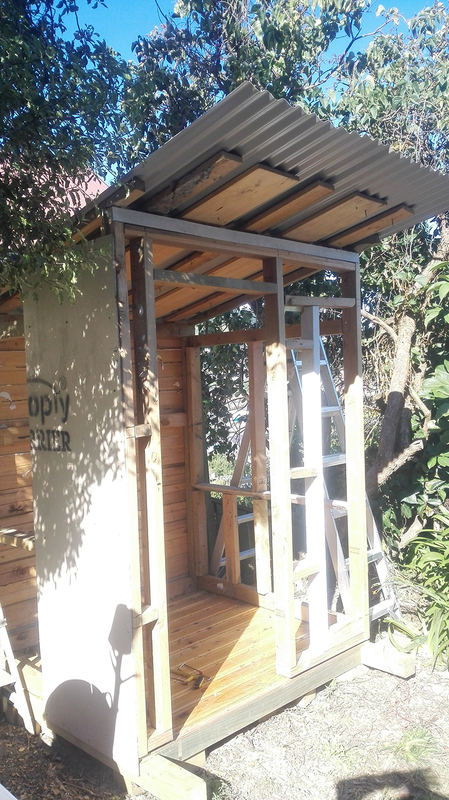 I used an electric drill with various bits (great for putting in screws… and taking them out again), but other than that I only used hand tools: tin snips, handsaw, chisel, hammer, crowbar (to remove the roofing nails when I had to rejig the roof). 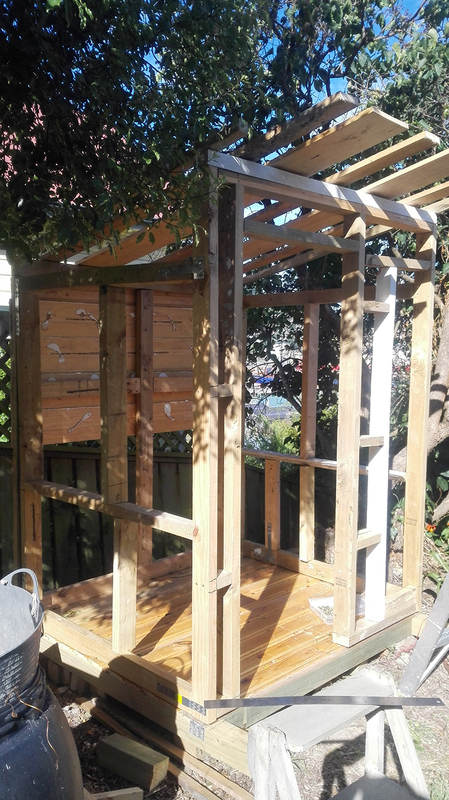 I read a book about building treehouses (How to Build Treehouses, Huts and Forts ) and watched a lot of YouTube videos to work out how to go about it (eg. this one and a bunch from My Self Reliance). Then I drew some plans to scale. 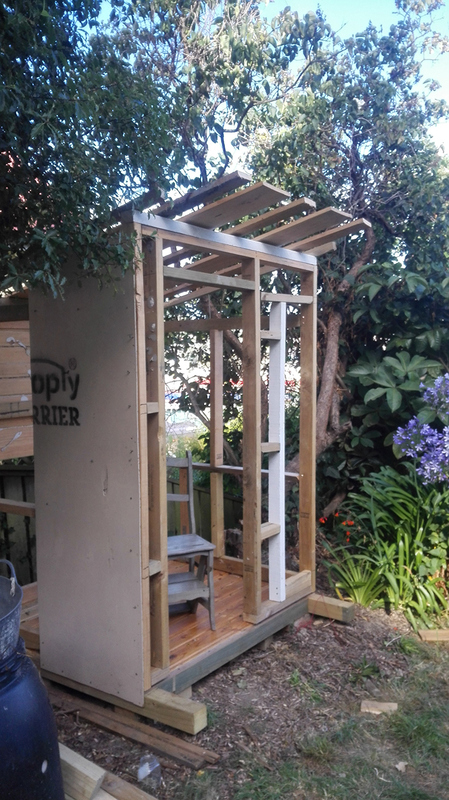 They were more or less what I followed for the framing of the shed before I cut and attached the corrugated iron. You can see my hand-drawn plans here and the following galleries show a step by step of how I did it. 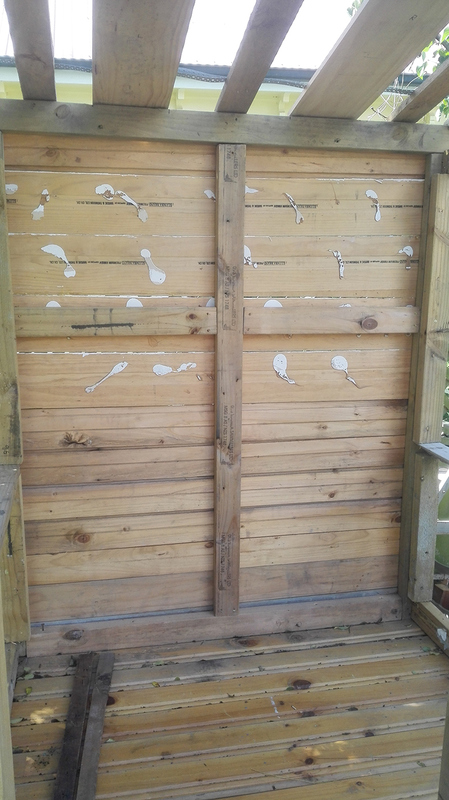 I pre-drilled holes in the hard wood (pine was fine, though I used a chisel to allow the heads to be sunk). 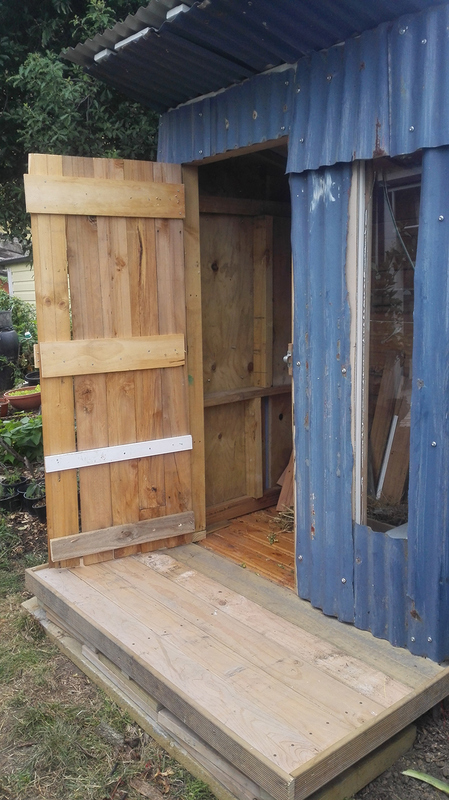 Screws are stronger and mean the shed can be taken apart. 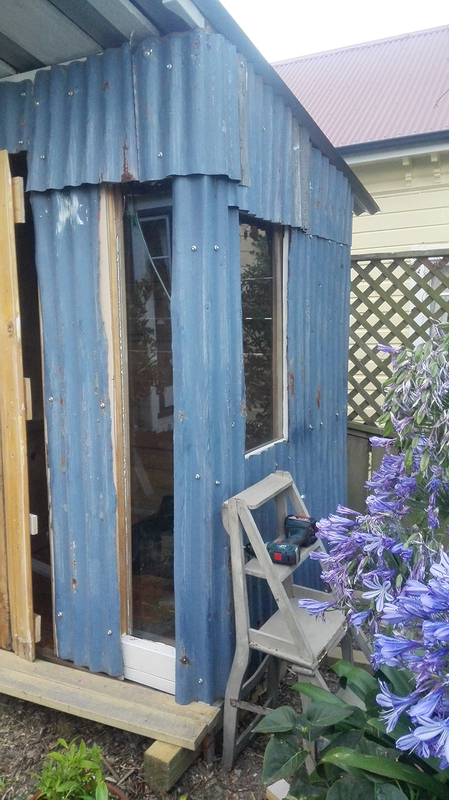 I used the old wall panelling for the back of the shed that won’t be seen. I’ll need to paint it with weatherproof paint. 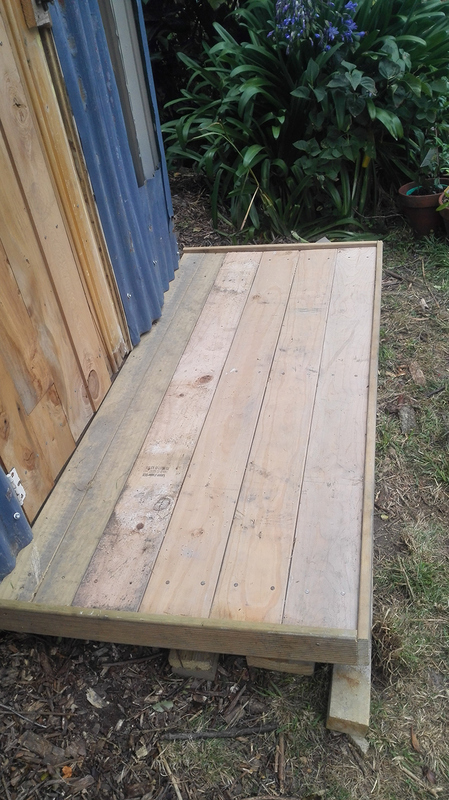 I chiselled out notches on the joists at the side of the shed, but just laid the other boards on top. 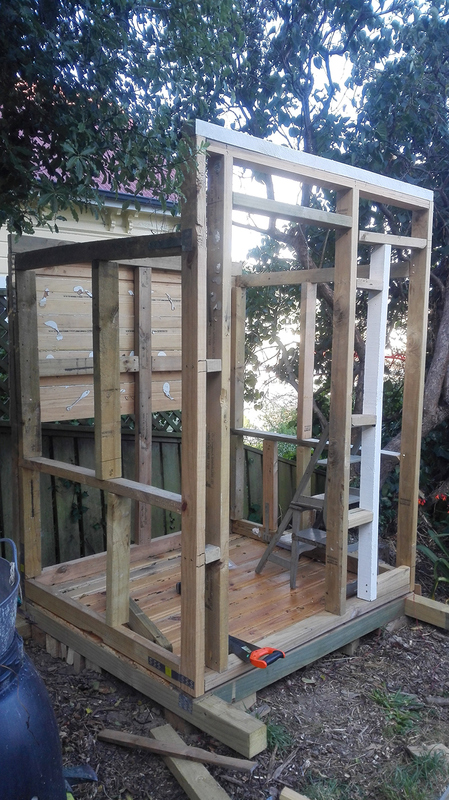 I started sawing to size and putting on the plywood that the corrugated iron would be attached to. 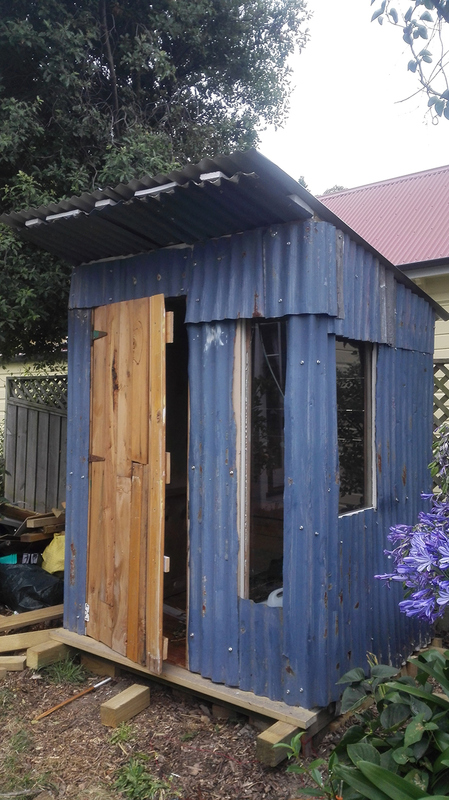 It makes the shed stronger and makes it easier to screw in the tin. I bought some vintage tin snips on TradeMe and cut the iron by hand. It was hard work and perhaps new tin snips would have been better! 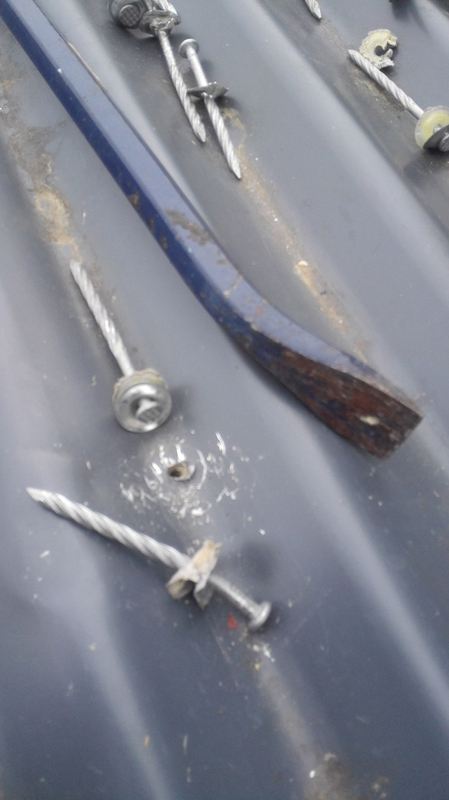 I discovered later it is so much better to use hex bolt roof screws, as getting roof nails out of a roof with a screwdriver, hammer and crowbar is bloomin’ hard work. We have great views and I had glass I could use, so I put in some windows (using wood slats, not putty, to secure them). This is hard. I learned that you don’t screw/hammer anything in after the window has gone in as you’ll crack it! 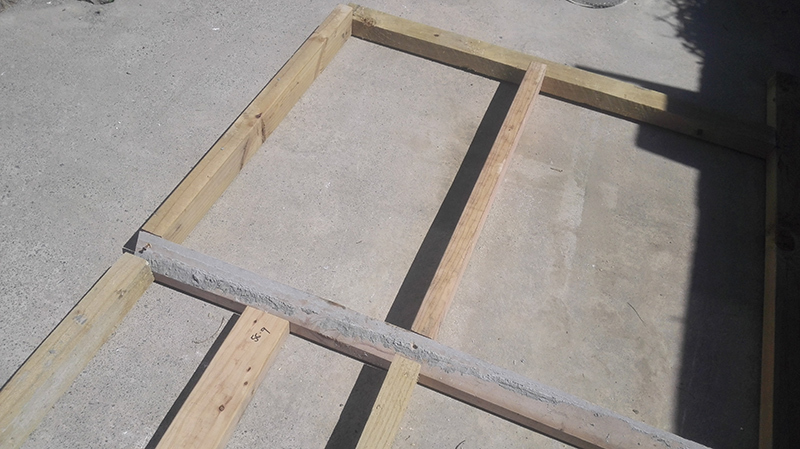 One window has been boarded further and I’ll need to replace another. But I have windows! 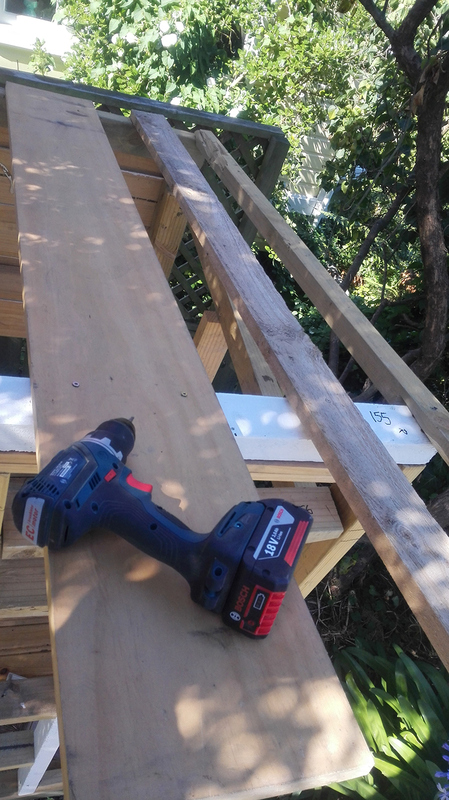 Attaching tin is so much easier with hex bolts. I pre-drilled holes in the tin and then used the drill to screw in the bolts. I wanted to shorten the overhang and attach tin to the underside. That meant I had to get the roof nails out. The only job worse than this was cutting the tin. 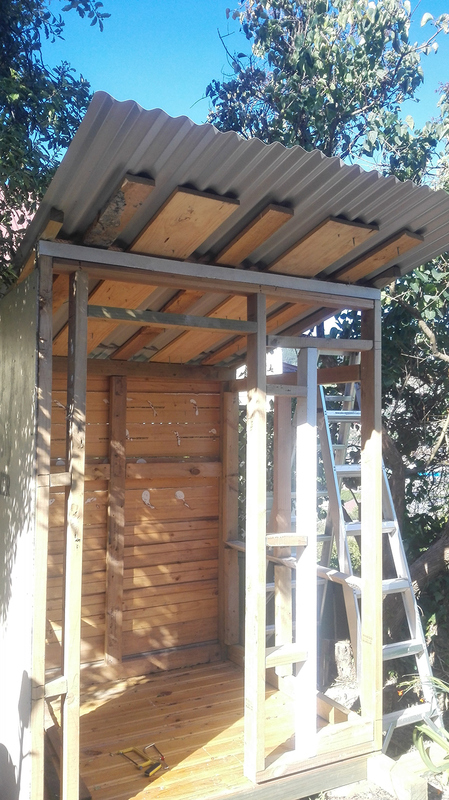 I then reattached the shortened roof with screws. 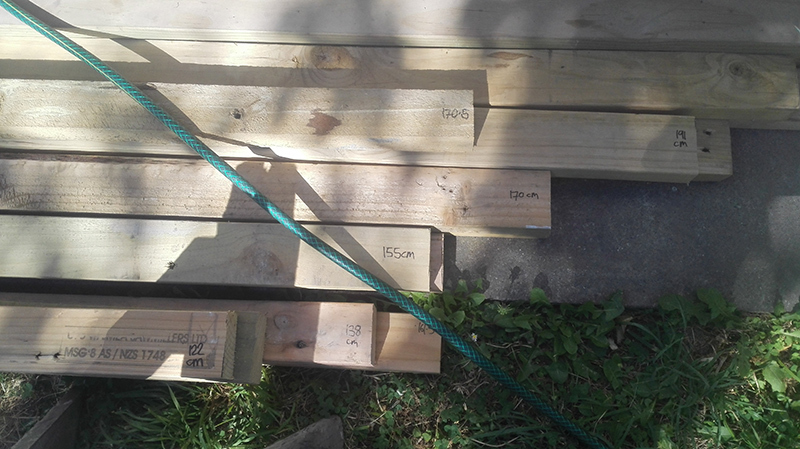 The deck is currently balanced on wood offcuts, as I’ll seat it properly on wood piles once the shed has been re-levelled. I bought the door latch from a garage sale in Lyttelton and found a thingy for it to go into at the eco-shop. Tuataras have been kicking around for a long time. They were a top predator in New Zealand before people arrived with their associated rats and other pests. I’ve only seen a tuatara in a zoo (in Invercargill. I think his name was Henry). But I have drunk a tuatara beer and it was lovely. I love the design of the glass bottle that tuatara beer is in. Quail I Island is in the middle of Lyttelton harbour. Māori called Quail Island “Ōtamahua”, the ‘place to gather sea-bird eggs’. None of that happens now, but I saw plenty of seabirds on the surrounding rocky reefs as I paddled over: terns, cormorants, oystercatchers and black-backed gulls with their young. When I got to the wharf, it was low tide, so I rock-hopped to the track. I stashed my board on the way up to the hut, behind the old stables. Quail Island was first settled by Europeans in the 19th century as a place to farm, but became a useful place for the new colony to quarantine animals and humans (Including lepers. Read more of the history at https://nzhistory.govt.nz/media/photo/quail-island ). These days no one is kept there against their will, but you can go over on the ferry and either spend half a day exploring the history, plants and birdlife, and little beaches, or stay overnight at the newly refurbished hut. 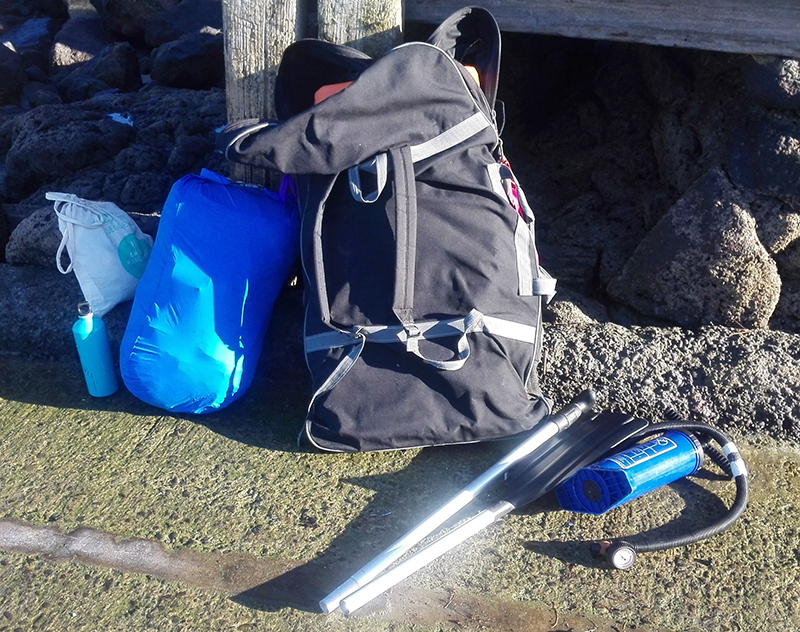 It costs $30 return to take the ferry from Lyttelton, but it’s an easy paddle in a kayak or on a stand up paddle board, if conditions are right. It took me just over half an hour to get there and about 40 minutes to return. The harbour is usually much calmer first thing in the morning, so it pays to time your paddling for this if this is the way you are going to go. The hut was built between 1910 and 1920 for the animal quarantine station caretaker by the Department of Agriculture. It was used as a caretaker’s cottage up until the early 1980s. Between 1906 and 1925, the caretakers provided cooked food for the lepers. In 1982, the hut was converted into the Island’s interpretation centre. The hut was refurbished for the public to stay in very recently, being opened at the beginning of November 2018. You have to book to stay overnight, either going to the DOC website here, or calling into one of the DOC offices. A bunk costs $15 an night and there are 12 bunks in the hut. I’ll definitely be going back. Hopefully when no one else is there. View of Lyttelton from the bunk room (each room has 6 bunks). Our house is behind the large white oil tanks on the left. My niece would love this rope swing, though it is a little tame for her. Looking back to Lyttelton from the wharf at night. 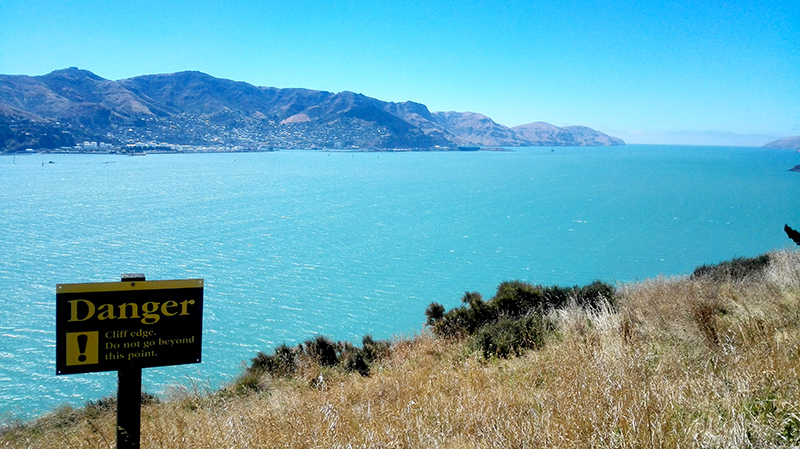 The morning of my return to Lyttelton: a good time to paddle. New Zealand first seals were hunted to the brink of extinction in the early 19th century (it seems most of the early settlers came to NZ to kill whales or seals). Now they litter the rocks in places like Ohau point near Kaikoura. There were lots of pups and when we stopped there in January. This is great to see as the colony was badly disrupted during the 2016 earthquake and subsequent rockfalls when more than 40 seals were killed. It took a year for the coast road to be repaired (during which seals had to be moved) . You can also go swimming with seals in Kaikoura. 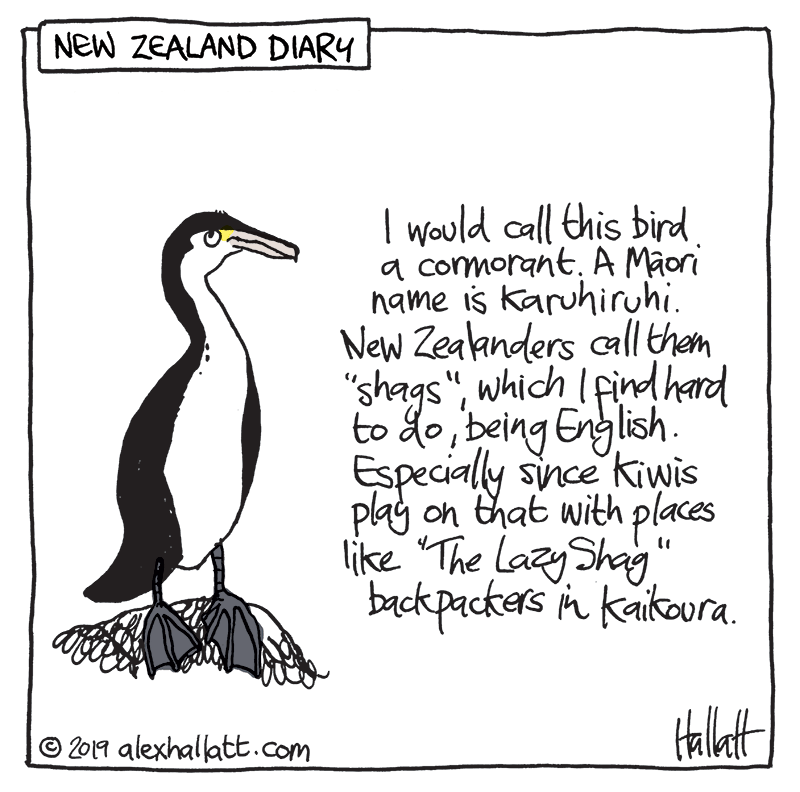 I did this when I was a backpacker in 1996 and it was one of the best experiences of the two months I spent in New Zealand. The seals are very playful, like underwater dogs. It is amazing to get so close to them. This is something that is not recommended when they are on the shore, where they become very territorial. More information on fur seals here. We haven't had a green waste bin ever since it disappeared with the tenants. Luckily we are on 1200 square metres and we can compost most of our green waste. What we can't compost (meat etc.) goes in the bokashi bin. My friend, Felicity, says bokashi has been miraculous at improving her garden. I hope so as it is it is a lot of work to lug it up to the back section and dig it in. Bokashi works using anaerobic fermentation with effective microorganisms (lactic acid bacteria, yeasts, photosynthetic bacteria, actinomycetes and fungi according to biome.com.au).. These come in the form of a bran which you sprinkle over your food waste. The airtight seal on the bucket keeps the fermentation anaerobic and there is another bucket below to catch the liquid (which can be diluted and used as a plant food. You can put in things you cannot put in compost like meat, cheese, fish and cooked foods like bread rice and pasta. The only thing you can't put in is liquids. Even bones can go in there and I put in the poor little mice that we trap in the kitchen cupboard. Once the bin is full, you can leave it to ferment longer or bury it in the garden straight away. It is like blood and bone on steroids.